Drewbie came by for dinner. Dad was not yet home from work, so Drewbie let himself in. When he entered Drewbie was met at the doorway by the they dynamic duo of home protection. 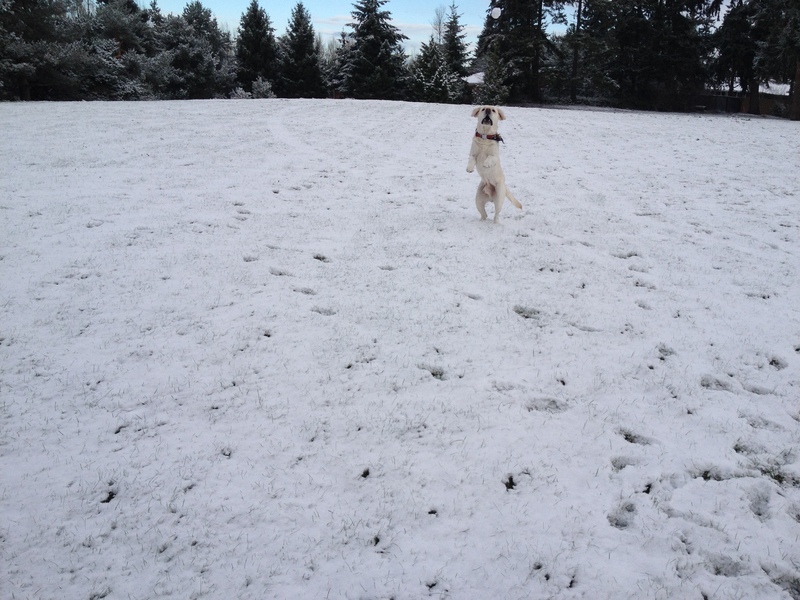 Mongo loved snow. Dad had not taken him to the snow lately. In fact Dad had not been around much lately. Dad had left Mongo at Mom-Mom’s for a week now. Mongo knew that Dad was very busy with something. He had been re-arranging the entire house. Nothing was sacred in Dad’s frenzy to put everything in the house into cardboard boxes. Mongo found it all very stressful to have the entire house disappearing into cardboard boxes. On the positive side, Mongo liked cardboard boxes and he ate parts of five different boxes Dad had brought home to put the household into. When Dad saw the boxes with corners eaten out of each one, his face sank. “Buddy? Did you have eat part of each one? Couldn’t you just eat all of just one?” Dad slid out of the door dejectedly and came back with another bundle of new boxes. And that’s when he had bundled Mongo up and driven him to Mom-Mom’s house. Still, Mongo knew that Dad would not leave him there forever. In fact, he was sure Dad would be back by Christmas. And when Dad came back to get him for Christmas, Mongo would be showing his best Christmas Spirit. What is the Blue Food? Dad finished scooping up the backyard, and headed back into the house. Suddenly, a flash of blue caught his eye. 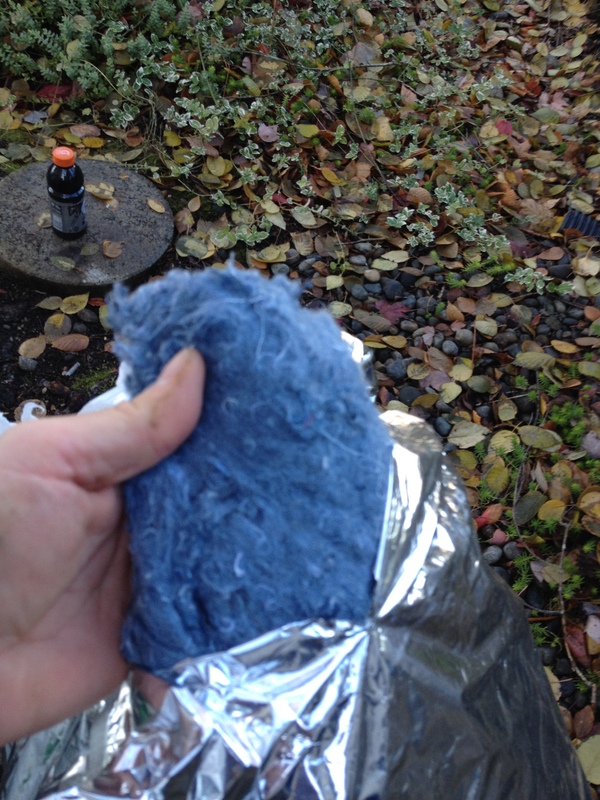 It was a piece of blue chopped rag insulation from a soft cooler. 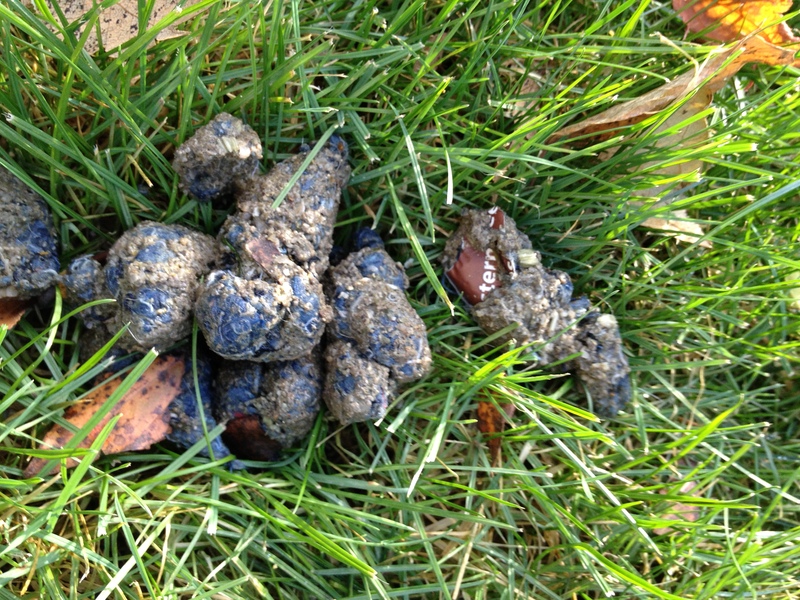 In essence, Mongo has been eating for sport again, and this time the result was blue. 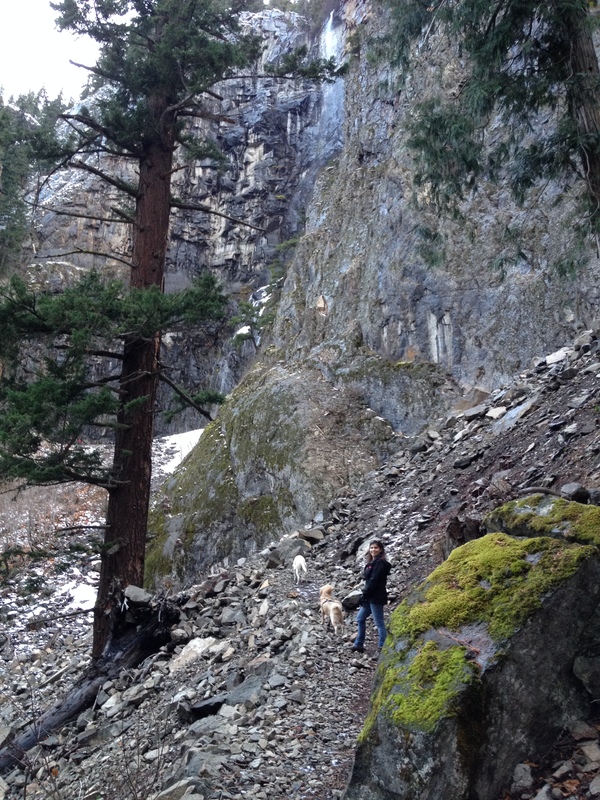 Today, Dad, Kimi, Mongo, and SPORK all headed up to the mountains for a hike. Kimi was carefully corralling water and cliff bars for the hike to Snoquera Falls. Dad was marshalling dog supplies. They busied themselves for the trip as Mongo and SPORK milled about in the back of the truck. It was Kimi’s and SPORK’s first trip to Snoquera Falls. Everyone had been busy in the morning. 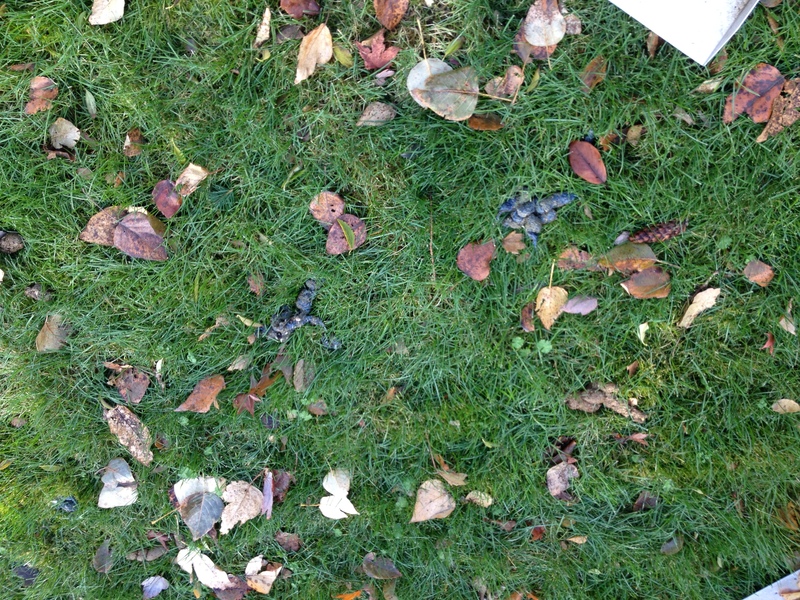 Some members of the team had been making piles in the backyard. Other members were scooping up piles in the backyard. When all the morning chores had been done, it was time to go on the hike. Unfortunately, it was a little late in the day. The crew didn’t leave until after 2 o’clock, but it was sunny as they drove through Enumclaw. It looked like a perfect day for a hike. That stop took about fifteen minutes. By the time they left Enumclaw, the sky had turned to a steely grey. The weather can change incredibly fast in the mountains. Kimi pointed to the tops of the mountains, and exclaimed, “Look it’s snowing in the mountains.” All of the mountains had a frosting of snow on their tops. It was 3 o’clock when they arrived at the trailhead. 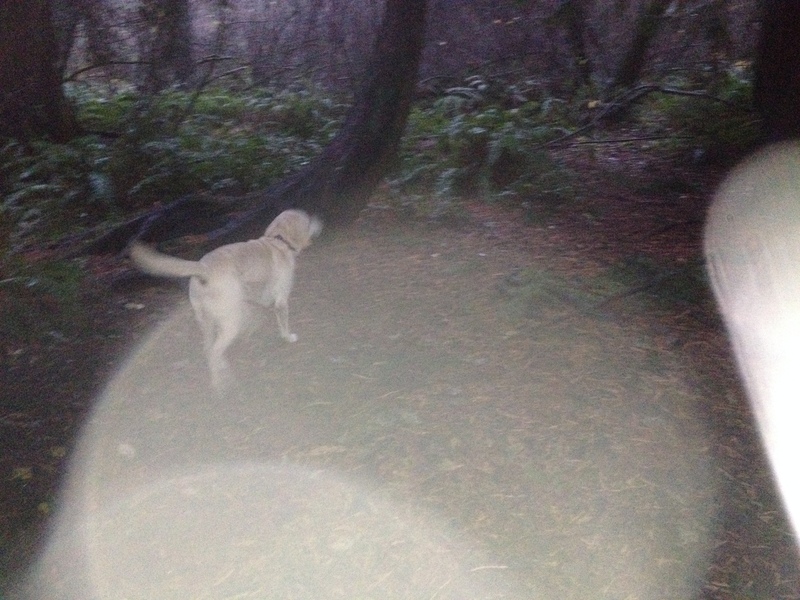 Mongo was thrilled to be back in the woods and went gamboling down the path. SPORK immediately went looking for small animals to kill. Dad shepherded everyone toward the trail-head and set the pace on the path. There was only an hour and a half of sunlight left, and neither Dad nor Kimi brought headlamps. However, they both did have cellphone lights. “Oh good”, said Kimi looking rather relieved. The group moved quickly up the base trail to the first switch back. “I call this part, The First Switchback” Dad informed Kimi. “That’s a very appropriate name” Kimi replied approvingly. The team kept moving. As they went higher, the group moved above the snow line, and into the clouds. It was becoming more difficult to gage the amount of light left in the day. But by the time shown on Dad’s watch, they were still set to return to the truck at exactly sundown. After a few more minutes, the group moved into another switchback. “What do you think I call this switchback?”, Dad asked Kimi. “Oh! That’s a good one. Much better than mine. We’ll go with yours.” Dad acknowledged. Kimi rolled her eyes, at her dad’s frivolity. As they finished the climb on the third switchback, Mongo saw the stream crossing the path and bolted for the water. 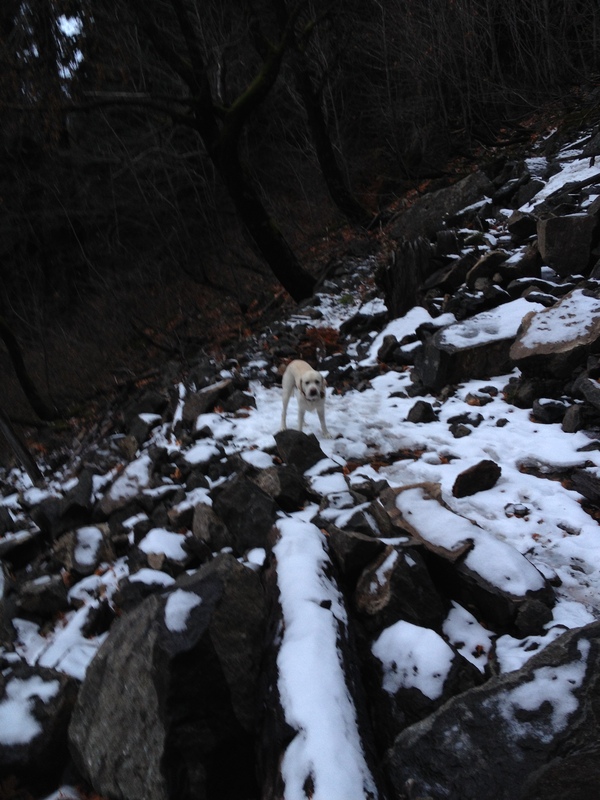 SPORK was busy checking all the trailside rocks for varmints to kill. “It’s a pretty view, don’t you think”, Dad asked. “Very pretty”, Kimi answered as she looked up at the falls. “Someday, I’m going to hike around to the top and look at the view from there, but to date, I never get here early enough”, Dad told her. The sun was dropping behind the mountains on the other side of the valley. “But clearly, I won’t go up there today either. Probably best if we head down now. I don’t want to get caught out on the trail in the dark.” They turned and headed back down the trail. On the turn out of the second switchback, Mongo decided to stop and do a little sniffing. The rest of the crew continued on. Mongo was still running free, and Dad still had SPORK’s leash. Dad didn’t think it was sporting to turn SPORK loose on the local wildlife. Mongo suddenly noticed that the rest of the crew had moved on. He spun and bolted down the path. As he passed Dad, he lost his footing on the edge of the trail and went tumbling by Dad. 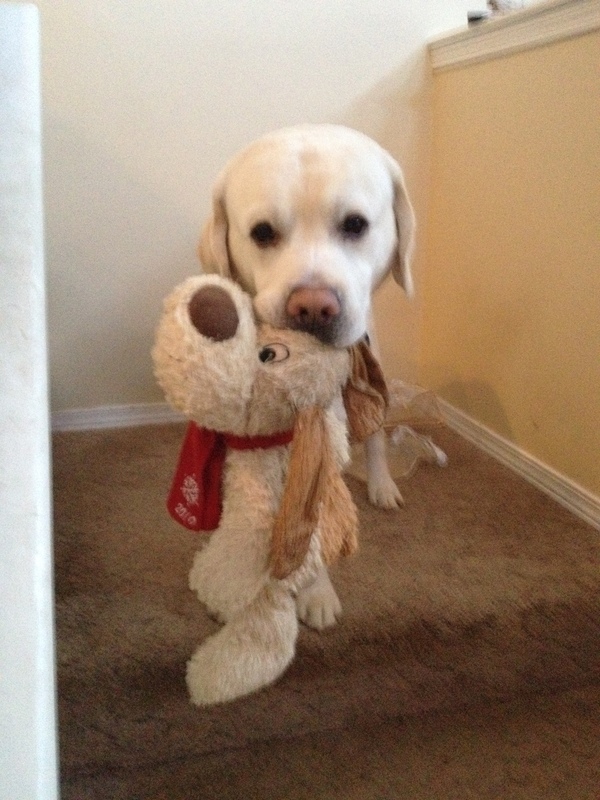 “Buddy! You need to be more careful. You could hurt yourself”, Dad cautioned him. Mongo gathered himself up and continued on down the trail. The team rounded the last turn and onto the base trail. It was getting a little wet on the trail. SPORK was pulling Dad along the trail. As Dad looked to see where Mongo had gotten off to, his foot slipped on a wet root. Immediately, Dad could hear the Fred Flintstone bongo theme playing in the background as he tried to gain his balance. But with each step, his foot slipped on another root. And all the while SPORK was pulling on the leash. The wet footing and the pull of the SPORK served to keep Dad unbalanced until he finally hit the ground. He thudded to the ground like a bag of cement. Dad righted himself, and they were soon on their way. 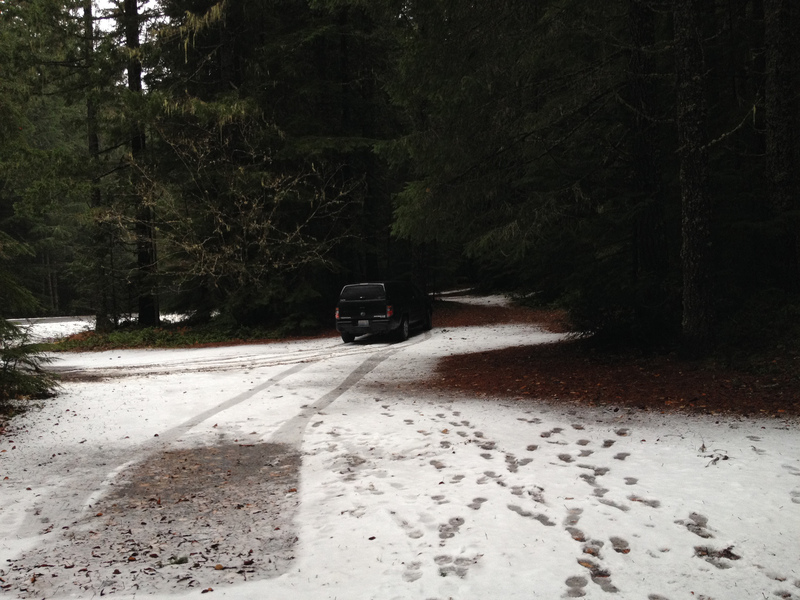 After a quick-time walk along the creek, they emerged at the clearing where they had left the car. It was precisely 4 o’clock, and the sun finally set. It was a grand end to another fun day in the mountains. The day after the snow, Dad and Mongo went in to West Seattle. It was cold and rainy. Dad was wrapped up in his ski jacket and waterproof boots. But as Dad was disembarking from the transport and heading through the parking lot, lo’ and behold, he saw a true NorthWest Holiday Tradition; the classic NorthWesterner in shorts and sandals in the midst of a winter squall. 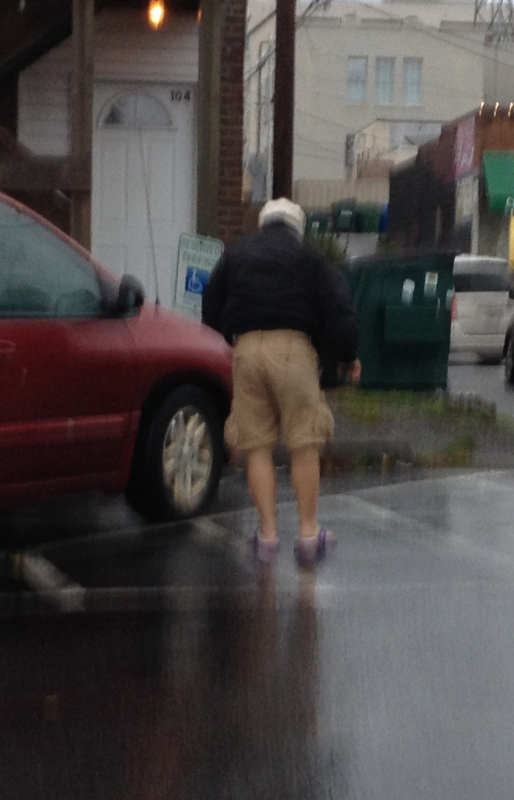 Here was a real “year-round shorts dude”, not just the Pemco stereotype of “year round shorts dude”. <Click HERE to learn more about Pemco Year-Round Shorts Dude.> Seeing the Shorts Dude filled Dad with the spirit of the holidays. He chuckled all the way into the Next to Nature store. 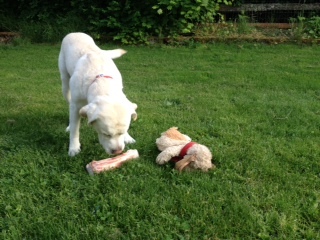 Dad finished his shopping and then he and Mongo went to the big park. It was almost dark, but both neither of them were concerned with the ambient light. After a fun walk in the cold rainy dark, they headed back home. 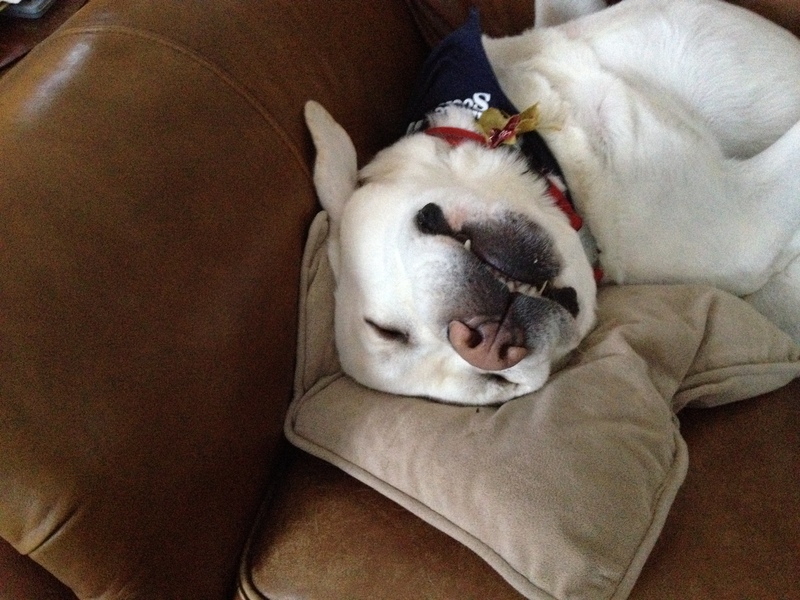 Mongo was exhausted from the big walk and fell fast asleep on the couch. It snowed in Seattle over the weekend. Mongo loves the snow. He romped through the park. He raced through the snow. He rubbed his ears in the snow. He plowed the snow with his nose, sniffing snowflakes. And then he and Dad played catch with snowballs. 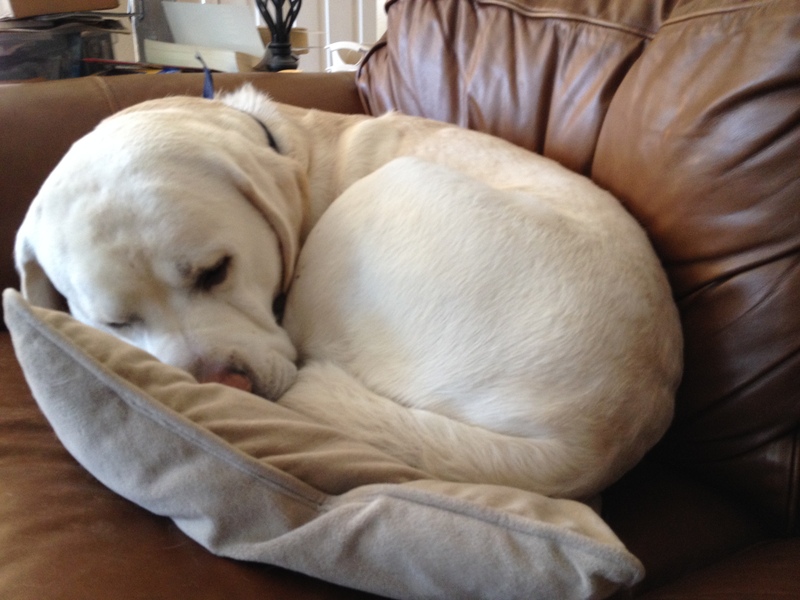 Afterwards, they went home, and Mongo curled up on the couch like a wee bitty 90 lb. puppy.